In our continuing conversation about the nature of the Eucharist and the role it plays in Christian theology, I wanted to introduce into our conversation the debate that divided the Reformers. Their debate had important implications for how the Eucharist came to be understood among Protestants. 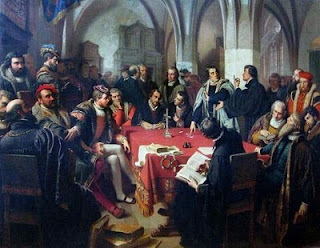 Over time Martin Luther and Ulrich Zwingli essentially became the spokespersons for two poles of opinion. Many followed one or the other, while others, including John Calvin, Martin Bucer, and Thomas Cranmer sought to find a place to rest somewhere in between the two poles. The debate at Marburg illustrates differences of opinion on how to interpret Scripture, a reminder that even if you believe the Bible to speak the word of God, it has to be interpreted! With World Communion Sunday on the horizon, I’ve been trying to reflect on the important ideas that stand behind the ways in which Christians understand the Eucharist. It should be evident by now that there isn’t just one Christian view. And while Paul believed that the Lord’s Table should be a table of unity (1 Cor. 10), historically the table has been anything but a source of unity. There is probably no better illustration of this than the debate that occurred on October 1-3, 1529, some 482 years ago, when Martin Luther and Ulrich Zwingli, the two leading figures in the Reformation to that point, faced off at Marburg Castle in Germany. Philip of Hesse a Protestant prince invited the leading Reformers from Saxony and Switzerland to his castle to bring unity to their ranks. That conversation, which got hung up on the question of the Eucharist, is a good illustration of the differences that exist within the Christian faith and the consequences of those differences. TRANSITIONS: Leading Churches through Change. Edited by David N. Mosser. Foreword by Robert Schnase. Louisville: WJK Press, 2011. Xv +248 pp. There is no shortage of books dealing with the idea that change is taking place within the church, but despite the plethora of resources there is still room for more contributions. The fact is, even though change is constant, and the pace seems to be growing exponentially every year, none of us, no matter our age, is truly comfortable with the pace of change. Just the other day, when Facebook issued another set of changes – pretty major ones – it seemed as if everyone, young and old, was upset. How dare Mark Zuckerberg change Facebook. Of course, it wasn’t so long ago that MySpace was the talk of the town, but it didn’t adapt and got left in the dust. So, even if we don’t always like the changes that come our way, more often than not the only choice we have is to adapt. Since I posted a piece on the Eucharist that looked to the perspective of the Early Church on the question of presence, I thought I’d add a piece on the medieval church, which is when the doctrine of Transubstantiation came into play.That doctrine remains standard in the Roman Catholic Church and is a cause of separation between Protestant and Catholic since the Reformation age. On the question of whether Christ is present in the elements or in the community, or in some other way, is open for discussion.Because I would agree with such figures as Keith Watkins that the Eucharist is a normative center (together with the Word) of worship, I would affirm a spiritual presence in the gathering at the Table.But, that is a different issue from the question of whether the elements are transformed into the real body and blood of Christ, a doctrine to which I do not hold. What is the path to spiritual growth? What practices will help us draw closer to God and empower us to live transformed lives? Bruce Epperly suggests that Paul provides such a guide in these verses from Philippians 4. I invite you to consider Bruce's reflections and add your thoughts. Good theology involves the interplay of vision, promise, and practice. It paints a picture of our world – God, humankind, grace and sin, creation, the future. It tells us that we can experience the ultimate realities of life, and it gives us practices to align ourselves with the ultimate sources of meaning and value in our lives. Jesus says “I am the bread of life.” These words are spoken in response to those seeking seeking free bread (after he feeds the 5000 plus). Free bread had always been used by the powers to be to keep the masses quiet or to buy their support. The crowd seems to be saying to Jesus – you give us bread and will give you our allegiance. As we look ahead toward this coming Sunday, at which time Christians from across the theological and geographical spectrum will celebrate the Eucharist/Communion/Lord’s Supper, it is worth giving attention to the meaning of this sacrament of the church and to its practice. If you do a search through this blog for the word Eucharist, you’ll find much to ponder. Being Disciple, a tradition that celebrates the service of the Table each week that may not be that surprising. I’m going to try to add in other materials as time allows to further the conversation.